If the water was to be contaminated, we believe that the existence of the Havasupai will disappear. We will stand and fight all the way. The price of uranium is at its lowest in over a decade. Renewable energy production in the US has surpassed nuclear. So why is the Trump administration making it easier to mine uranium? Did the uranium mining companies ask politely? Let’s look at what the first year of Trump has brought uranium mining corporations. Last March Trump issued an executive order requiring federal agencies to propose ways to remove “burdens” from the nuclear and fossil fuel industry. Use of federally protected lands was one area these “burdens” could be removed. Native American communities were not consulted regarding the “burdened” industries and the false, but common assumption was made, that the fate of federal land should be a matter of the United States government rather than its original inhabitants. In November the Department of Agriculture responded to Trump’s order, in part, with a recommendation to lift the ban on new uranium mines near the Grand Canyon. The 20-year ban was put in place in 2012 after five years of campaigning by a coalition of tribal and environmental organizations. In December, the ban was upheld by the 9th US Circuit Court of Appeals, a move lauded the world over. 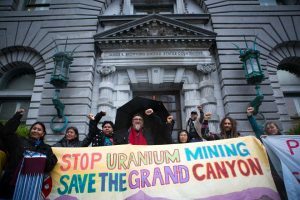 However, uranium multinationals have not let the Grand Canyon out of their sight, and the Trump administration may still overturn the ban. On Dec. 20, less than a week after the ban was preserved, another executive order was issued to reduce reliance on foreign imports of “critical” minerals. A draft list of the minerals released in February included uranium. The same day the Grand Canyon mining ban was upheld, there was a separate ruling against the Havasupai Tribe allowing the Canyon Mine, located on sacred ancestral Havasupai land to open only six miles from the Grand Canyon. The Canyon Mine, owned by a subsidiary of Energy Fuels Resources of Canada, began the licensing process before the ban was in place. Energy Fuels had another success in December when Trump used the Antiquities Act to slash the size of Bears Ears National Monument (BENM) in Utah by 85%. (The simultaneous reduction in Grand Staircase-Escalante National Monument was related to coal interests.) Although Secretary of Interior Ryan Zinke had stated that there was no mine within Bears Ears, the New York Times found 300 claims according to data from the Utah Bureau of Land Management. Just outside of the Monument’s newly drawn boundaries, about one-third of those claims are associated with Energy Fuels. This is not surprising considering they openly lobbied for the reduction in the Monument and distributed maps to legislators carefully detailing areas they would like removed from protected status. In a letter to Secretary Zinke obtained by the Washington Post, Energy Fuels Chief Operating Officer Mark Chalmers spelled out the company’s areas of concern and added unabashedly, “There are also many other known uranium …deposits located within the newly created BENM that could provide valuable energy and mineral resources.” Despite the overwhelming support (98%) for maintaining or expanding the National Monuments demonstrated in public comments to the Department of Interior, a foreign mining company had more influence. Communities on the frontlines and nationwide coalitions are actively opposing the special interests and are not giving up without a fight. To help resist Energy Fuel’s Canyon Mine and the transport of uranium is to take Haul No!’s Pledge of Resistance.